The European Space Agency (ESA) was formed to unite the European continent in the mission to explore space. ESA develops technology for space exploration, conducts research missions, and collaborates with international partners on projects like the development of the Hubble Telescope and the study of gravitational waves. Today, 22 member states are involved with ESA, which is the third-largest space program in the world. The European Space Agency (ESA) was created 1975 as a result of a merge between the European Launch Development Organization (ELDO) and the European Space Research Organization (ESRO). European nations had already been pursuing space exploration for over a decade, but the creation of the ESA marked an opportunity to develop a major space program outside the control of the U.S. and then-Soviet Union. 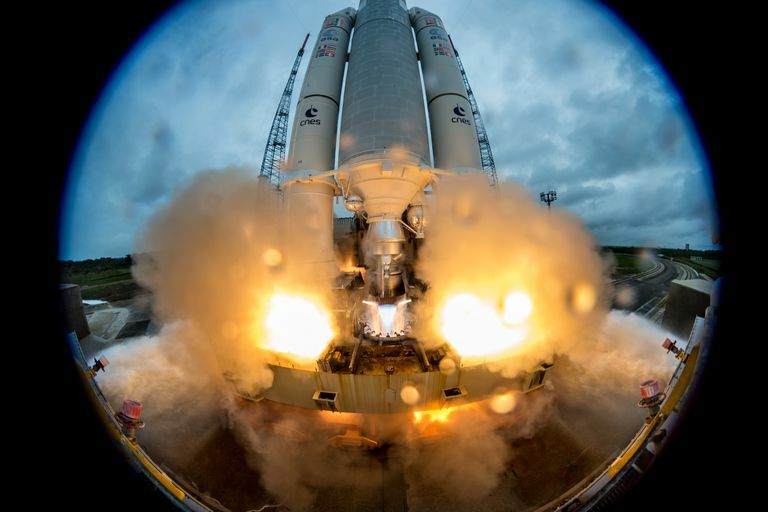 ESA serves as Europe's gateway into space. It combines the space-faring interests of Austria, Belgium, Czech Republic, Denmark, Estonia, Finland, France, Germany, Greece, Hungary, Ireland, Italy, Luxembourg, the Netherlands, Norway, Poland, Portugal, Romania, Spain, Sweden, Switzerland, and the United Kingdom. Other countries have signed cooperative agreements with ESA, including Bulgaria, Cyprus, Malta, Latvia, and Slovakia; Slovenia is an associate member, and Canada has a special relationship with the agency. Several European countries, including Italy, Germany, and the U.K., maintain independent space operations but also cooperate with ESA. NASA and the Soviet Union also have cooperative programs with the agency. ESA's headquarters are located in Paris. ESA's contributions to astronomical studies include the Gaia space observatory, which has the mission of cataloging and charting the locations of more than three billion stars in the sky. Gaia's data resources give astronomers detailed information on brightness, motion, location, and other characteristics of stars both inside the Milky Way Galaxy and beyond it. In 2017, astronomers using Gaia data charted the motions of stars within the Sculptor dwarf galaxy, a satellite of the Milky Way. That data, combined with images and data from the Hubble Space Telescope, showed that the Sculptor galaxy has a very elliptical path around our own galaxy. ESA also observes Earth with the goal of finding new solutions to climate change. Many of the agency's satellites provide data that help with weather forecasting, and trace changes in Earth's atmosphere and oceans caused by long-term changes in climate. The ESA's long-running Mars Express mission has been orbiting the Red Planet since 2003. It takes detailed images of the surface, and its instruments probe the atmosphere and study mineral deposits on the surface. Mars Express also relays signals from missions on the ground back to Earth. It was joined by ESA's Exomars mission in 2017. That orbiter is also sending back data about Mars, but its lander, called Schiaparelli, crashed on descent. ESA currently has plans to send a follow-up mission. Past high-profile missions include the long-running Ulysses mission, which studied the Sun for nearly 20 years, and cooperation with NASA on the Hubble Space Telescope. One of ESA's upcoming missions is a search for gravitational waves from space. When gravitational waves crash into one another, they send tiny gravitational ripples across space, "bending" the fabric of space-time. The detection of these waves by the U.S. in 2015 set off a whole new era of science and a different way of looking at massive objects in the universe, such as black holes and neutron stars. ESA's new mission, called LISA, will deploy three satellites to triangulate in on these faint waves from titanic collisions in space. The waves are extremely difficult to detect, so a space-based system will be a big step forward in studying them. Gravitational waves aren't the only phenomena in ESA's sights. Like NASA scientists, its researchers are also interested in finding and learning more about distant worlds around other stars. These exoplanets are scattered throughout the Milky Way and undoubtedly exist in other galaxies, too. ESA plans to send its Planetary Transits and Oscillations of Stars (PLATO) mission in the mid-2020s to seek out exoplanets. It will join NASA's TESS mission in the search for alien worlds. As a partner in international cooperative missions, ESA continues its role with the International Space Station, participating with the U.S. and Russian Roscosmos program in long-term science and technical operations. The agency is also is working with China's space program on the concept of a Moon Village. The European Space Agency was founded in 1975 in order to unite European nations in the mission to explore space. ESA has developed a number of important projects, including the Gaia space observatory and Mars Express mission. A new ESA mission called LISA is developing a space-based strategy for detecting gravitational waves. "ESA Science & Technology: Gravitational Wave Mission Selected, Planet-Hunting Mission Moves Forward". Sci.Esa.Int, 2017, http://sci.esa.int/cosmic-vision/59243-gravitational-wave-mission-selected-planet-hunting-mission-moves-forward/. "History Of Europe In Space". European Space Agency, 2013, http://www.esa.int/About_Us/Welcome_to_ESA/ESA_history/History_of_Europe_in_space.